Apparently when I was a kid, I liked apples. (For those of you just tuning in…I am a bona fide fruit hater, so the apple thing is unusual.) I have no memory of this, but my parents swear I used to pinch apples that my dad had been eating, toddle away, and bring him back the core. Whether or not that is just a story they made up to try to convince me to eat apples at lunch every day in elementary school, I don’t know. What I do know is that I am developing a begrudging acceptance of apples in my adulthood. Granny Smith apples, to be specific. I like the tartness and the crunch. Don’t get me wrong—I still don’t like fruit. 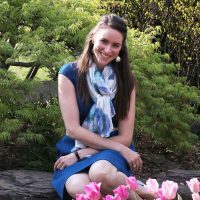 So imagine my surprise when I started seeing recipes that threw apples and cheddar cheese together, and my first thought was, “Oh, interesting! I’ll have to try that!” (…who am I?) Apple cheddar biscuits, apple cheddar scones…it seemed like a perfectly weird Fall combination that I might actually enjoy! So when I was assigned No Reason Needed for this month’s Secret Recipe Club challenge, and I spotted a recipe for apple cheddar loaf, I knew I had to try it. It’s quick, it’s simple, and no matter how strange you find the combination of fruit and cheese, it’s delicious! I did make several changes to this recipe, mainly because I wanted to make it as a quickbread rather than a cake. I have an infant…so anything that can be thrown into the oven with a minimum of time and effort is a winner! So for starters, I ditched the creaming method and subbed oil instead. Nothing like a quick stir to save some time! Because I was making a quickbread version, I consulted my go-to muffin recipe and tweaked some of the amounts to more closely mimic those ratios, adding milk, taking away an egg, and upping the leavening. I also decided to use brown sugar, which I thought would complement the apples and the whole wheat flour very well. One thing I might try next time I make this is subbing applesauce for some or all of the oil—this is, after all, an apple-flavored bread, so what could be better than intensifying the apple content? This recipe turned out to be so simple to make. 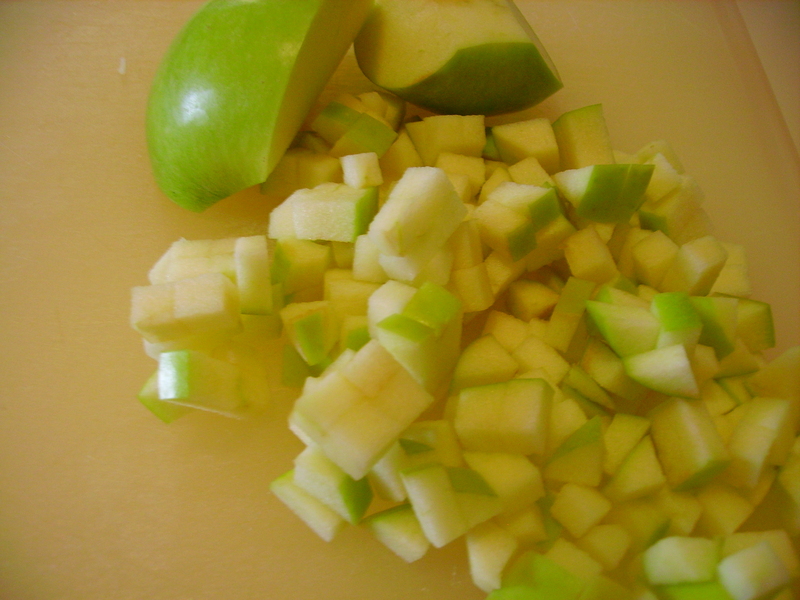 The hardest part was chopping up the apple, which honestly only took 3 minutes. So you have no excuse not to try it! Stir together the wet ingredients in one bowl, and the dry ingredients in another. I used whole wheat flour, both because I wanted something a bit healthier, and because I was opting to skip the nuts called for in the original recipe. Whole wheat flour has a nutty flavor and aroma, so it seemed like the perfect compromise! Stir the dry ingredients into the wet. Don’t over-stir! This is a quickbread, after all, meaning that the batter should be lumpy. If you stir until everything is completely smooth and even, the bread will bake up a bit dry and chewy. Next, chop up the apple and shred the cheese. I used a bit more than 1 cup shredded cheddar, because I had cut off a more exuberant hunk than I needed…plus, as the original recipe commented, shredded cheese packs a little less of a wallop than chunks of cheese would, and I really wanted to taste the cheese in the baked bread. Even with the extra (I used about 1⅓ cups), the cheese faded into the background a bit, so next time I might use even more! 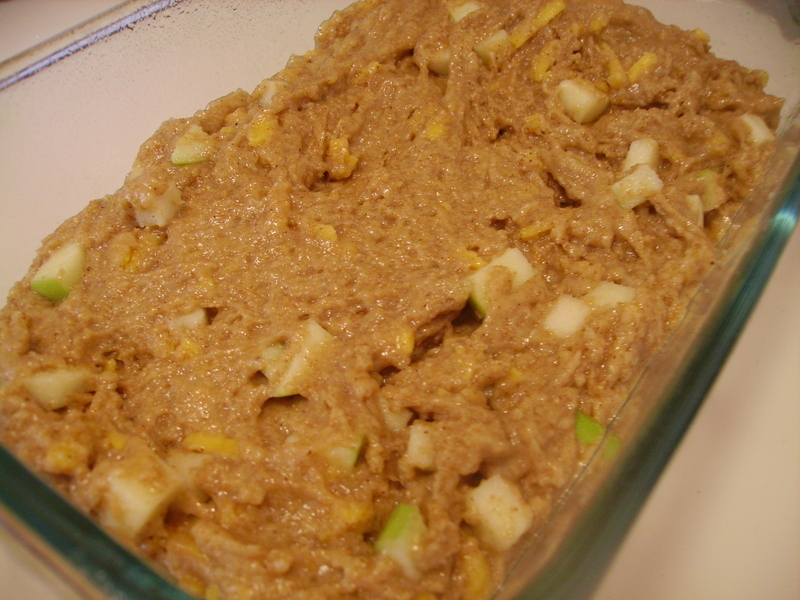 Stir the apples and cheese into the batter, then dump the whole shebang into a greased (and floured, if you like) loaf pan. My loaf pan was actually closer to 8″x4″, so I had to increase the baking time a bit to compensate. Bake 35–45 minutes (mine took 40), or until the top is golden and the center is set. Test with a toothpick for doneness. 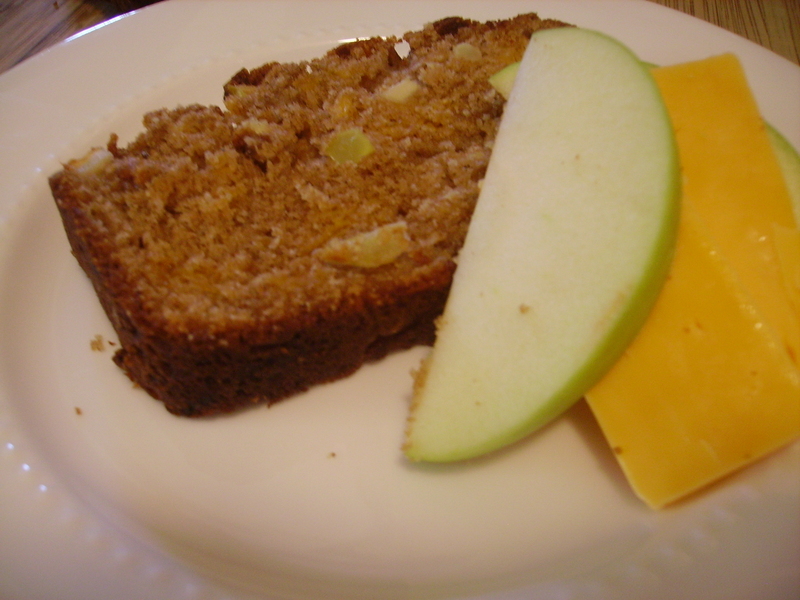 Let the loaf cool, then enjoy a slice with a few extra pieces of apple and cheddar! Preheat oven to 400°. Grease and flour a 9ʺx5ʺ loaf pan. Mix together the oil, milk, sugar, and egg. 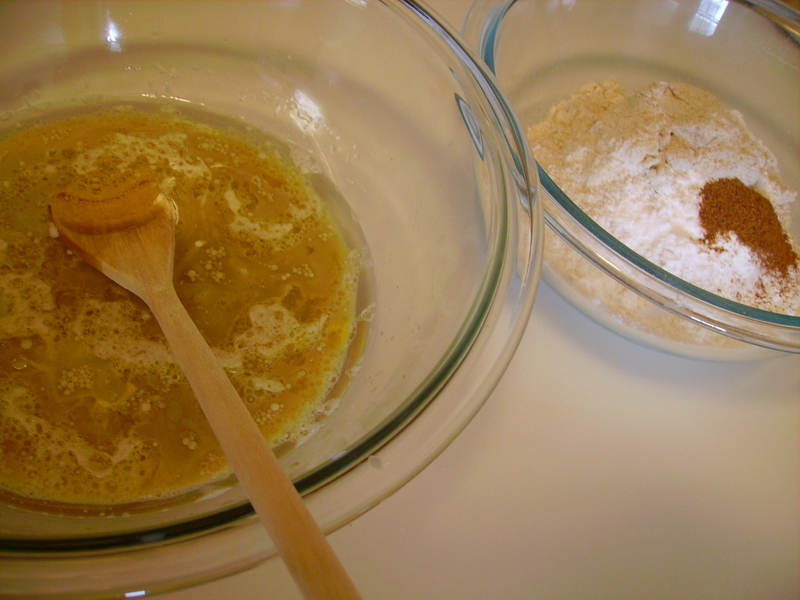 In a separate bowl, whisk together flour, baking powder, baking soda, salt, cinnamon, and nutmeg. Stir the dry ingredients into the wet ingredients. Fold in apple and cheese. Don’t overmix the batter. Bake for 45 minutes. Cool 10 minutes in the pan, then turn out on rack to finish cooling. 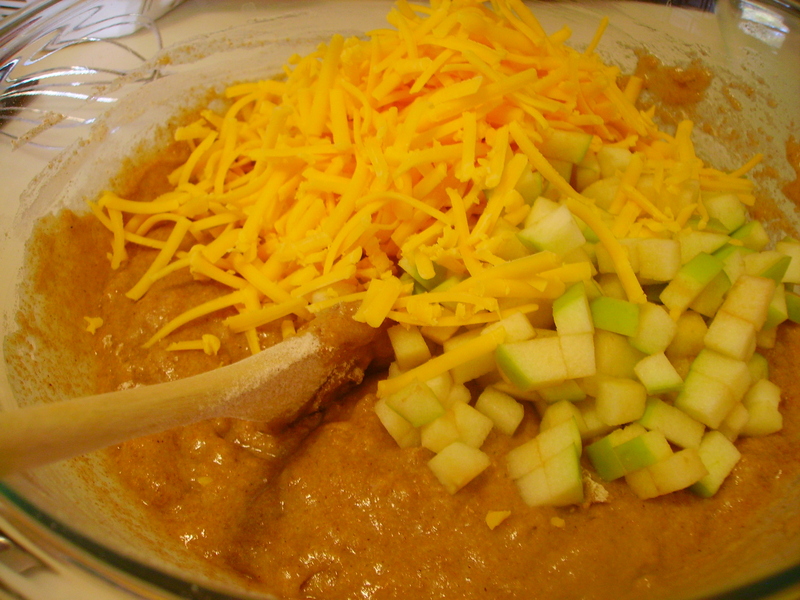 I am an apple love and this cheddar apple combination looks divine! 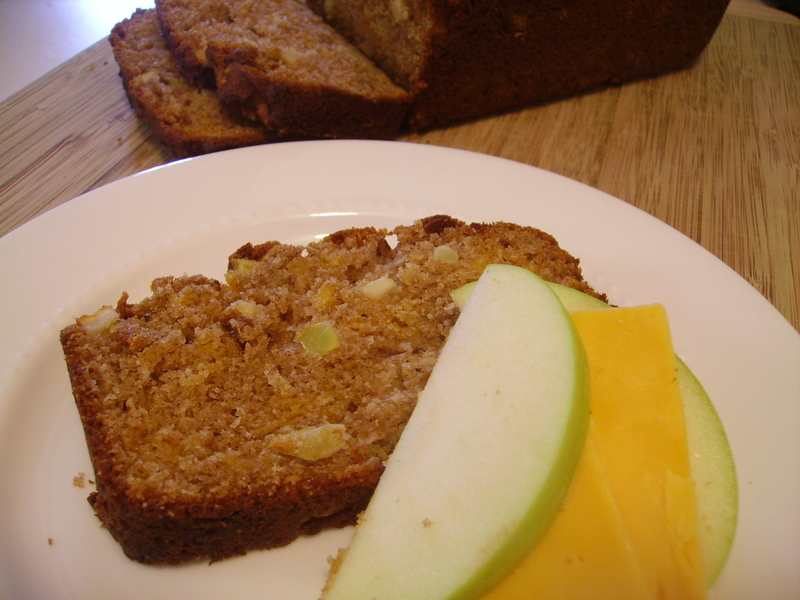 Your Apple Cheddar Quick bread, and this is a great recipe for the SRC. What an interesting combo! Sounds yummy though!